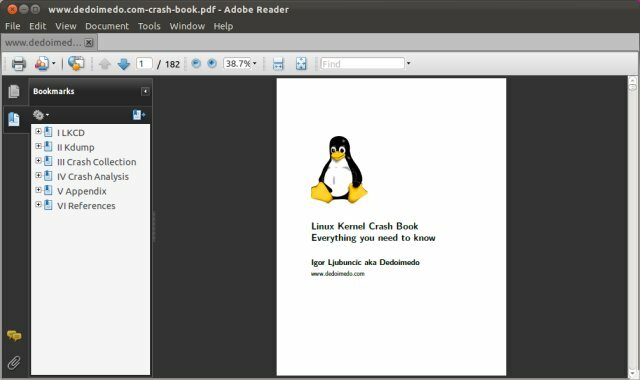 PDF Readers for Linux - which one is the best? PDF documents, we all like them and use them. Some people read their PDF inside browsers. However, most people have a dedicated reader they use for this purpose. Linux users are no different, they too use some kind of program for this task. The question is, which is one is the best? In this article, I'm going to review several popular PDF readers available for free. The requirements are simple: They must be installable from within the repository, without any manual configurations. Moreover, they must be reasonably well maintained. 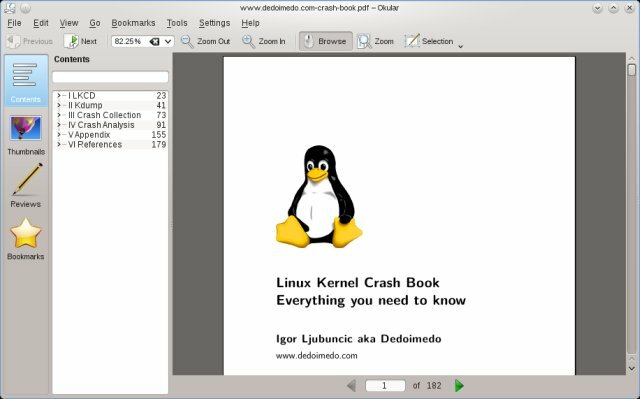 While there are a lot of PDF readers for Linux, some have not been updated in years, making them unsuitable for this contest. Lastly, I'm going to test them as they are, without referring to help or manual. So if there's something out there that I can't find, it's gonna be the software fault, not mine. Let's rock. Evince is the default reader for Gnome and Unity desktops. It is a lightweight and fairly simple program. It can view several document formats, in addition to PDF, including PostScript, Djvu, DVI, and TIFF. 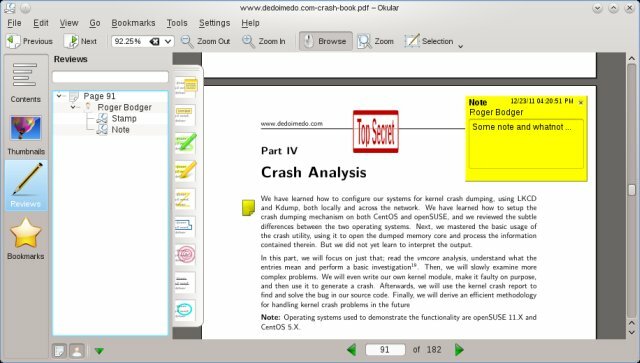 Evince allows watching documents in a single-page view mode, side-by-side two pager and slideshow, and you can bookmark pages and chapters. Overall, Evince looks like a decent program, with a reasonable quality of font rendering. The interface is rather spartan, for good or worse. There are no editing, reviewing and annotation tools available. 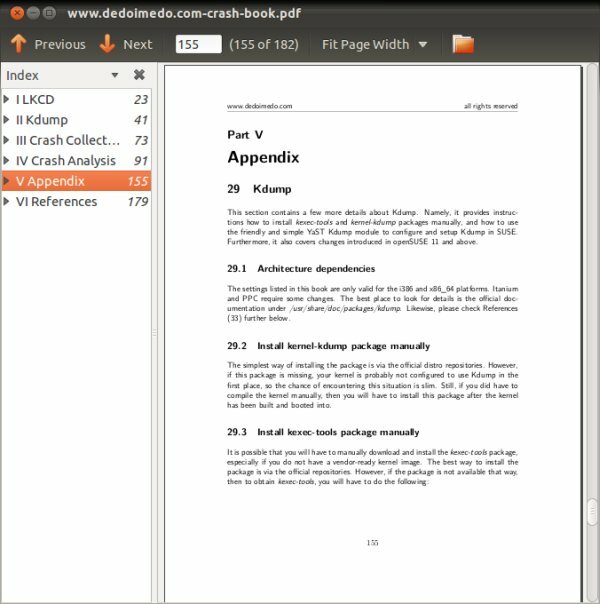 Adobe Reader for Linux lags a little behind the Windows version. 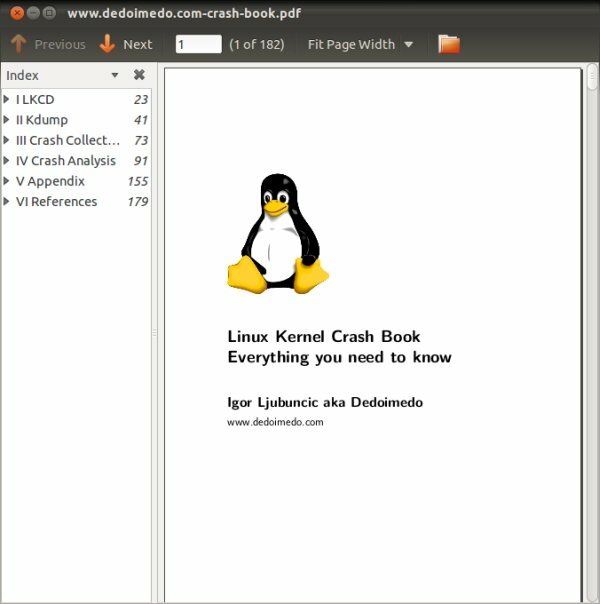 The Linux edition is currently limited to 9.X family, while Windows has already seen the X version, which is designed to address the huge number of security vulnerability in this program on Windows. 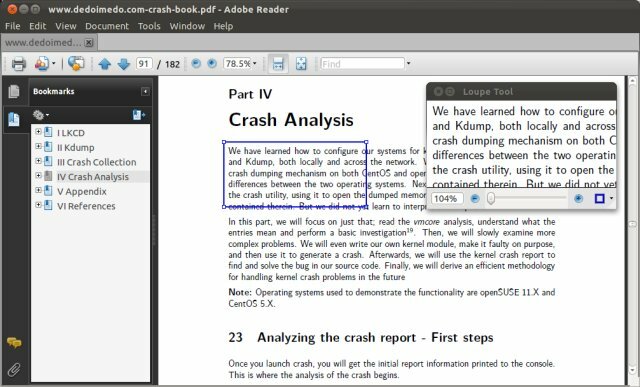 Acrobat Reader supports optical character recognition, text-to-speech translation, Flash, and security extensions. Font quality is very good. You also have a limited number of read-assisting tools, including loupe, text selection and others. LibreOffice can open and import PDF files if you install the necessary extension, called libreoffice-pdfimport. This will allow you to import the said files into Draw. You cannot import files using other applications in the suite. My testing shows low fidelity of import, with non-uniform spacing and overflowing text. 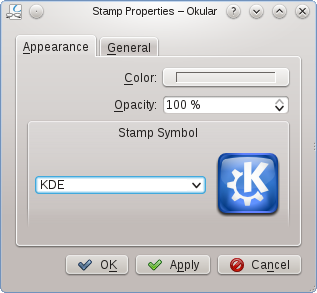 Okular is available on KDE desktops, like openSUSE or Fedora. The program supports a large number of file formats, including PostScript, TIFF, Djvu, CHM, DVI, XPS, ODF, and others. Font quality is quite reasonable, plus you get a large number of complementary tools. You can bookmark pages, as well as review them. The reviewing toolbox is especially rich. You can add notes, shapes and free text to your documents. You can also place stamps with a wide range of logos and colors. Notes and text can be colored and resized. Most importantly, the changes are preserved after you close and reopen the files. And the winner is ... Okular. This program seems to offer the best blend of capabilities required in a PDF reader. You can use it just for reading, but if you need more, it's all there. It's the only program that lets you edit and annotate your documents, plus it supports the widest range of file formats. Alongside Acrobat Reader, it has the best font rendering, although Adobe's product leads by a small margin. All in all, Okular is the most complete package. Well, I hope this article has provided you with some insight into the possible choices, their pros and cons, as well as the available repertoire of file formats and functions. Let us not forget the beauty either. Winner: Okular, 9/10. Well, that completes this round of testing. If you have other software you'd like to suggest for reviews or comparisons, feel free to ping me.